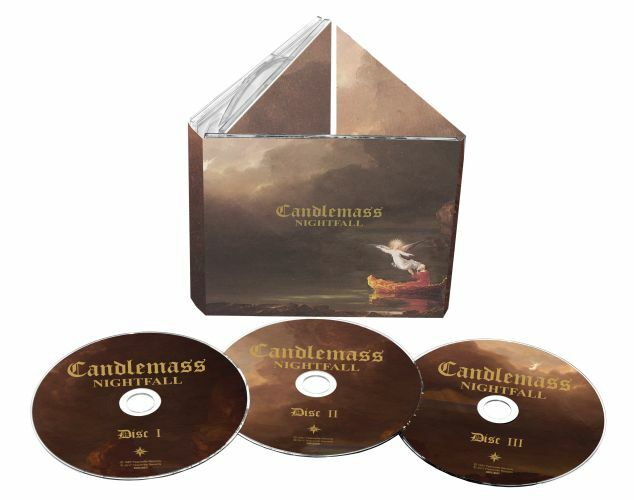 CANDLEMASS - NIGHTFALL 30TH ANNIVERS. DELUXE EDIT. (3CD DIGI) | Online Shop | Wizard LTD. Album: "NIGHTFALL 30TH ANNIVERS. DELUXE EDIT. (3CD DIGI)"
Special 30th Anniversary 3CD edition of one the most essential Doom Metal albums. Marking 30 years since its original release comes the definitive edition of one of the all-time classic Doom Metal albums. Legendary Swedish band Candlemass - formed in 1984 - is known for its influential &apos;Epic Doom Metal&apos; sound, which ievolved out of the masterful Black Sabbath. Released in 1987, Nightfall was the second Candlemass studio album. Alongside the band’s debut Epicus Doomicus Metallicus, Nightfall was instrumental in shaping the birth of the still thriving Doom Metal scene. On Nightfall, making his debut with the band was vocalist Jan Alfredo Marcolin, better known as Messiah Marcolin, who became highly respected due to his powerful, soaring and theatrical tones. This deluxe anniversary edition includes previously unreleased alternate rough mixes of the album, tracks from the studio sessions, plus a rare rehearsal recording from 1987 featuring renditions of songs prior to the album being recorded. The 16 page booklet contains text recounting the events of the period from the recent Behind the Wall of Doom book release, as well as liner notes from founder Leif Edling recording his thoughts on Nightfall reaching such a prestigious milestone, and the album’s influential place in metal history.